Maple syrup sweetens all components of this stunner of a cake. There is light and airy chiffon cake made with oat, sweet rice, and millet flours that you’ll never believe are gluten-free. 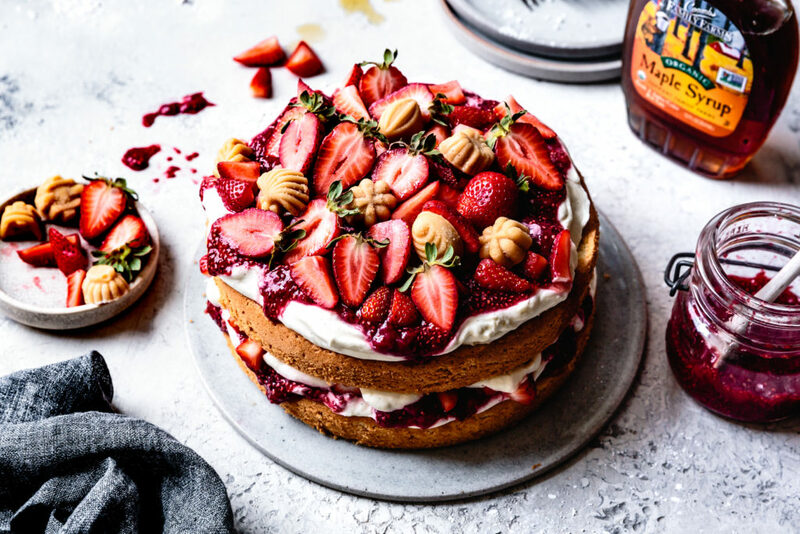 Billows of vanilla whipped mascarpone top the cake layer, swirled with strawberry chia jam – worth making in its own right to eat with yogurt or toast. The cake itself is dairy-free so if you prefer, use whipped coconut cream in the filling for a dairy- and gluten-free cake that all your guests can enjoy. Use your favorite grade of Coombs maple syrup here. Position a rack in the center of the oven and preheat to 325ºF. Line 2 ungreased 8-inch round cake pans with rounds of parchment paper cut to fit. The cake batter will crawl up the sides of the ungreased pan as it bakes, making the cake extra fluffy. In a large bowl, whisk together the oil, egg yolks, and maple syrup. Place a strainer over the bowl and sift the sweet rice, millet and oat flours with the baking powder and salt directly into the yolk mixture, adding back any bits left behind in the strainer. Whisk until very smooth. whites with the cream of tartar on medium-high speed until soft peaks form. Slowly add the sugar and whip until the whites are glossy and just hold a firm peak when lifted from the bowl, 1–3 more minutes. a thin, even layer. Transfer to the oven and bake until the cake is golden, springs back to the touch and a toothpick inserted near the center comes out clean, 20-30 minutes. Remove to a rack and let cool completely in the pan. Combine the quartered strawberries, maple syrup, and lemon juice in a large saucepan. Bring to a simmer over medium high heat, then lower the heat to maintain a simmer. Cook until the juices bubble thickly and are reduced by about half, 10-15 minutes. Stir in the chia seeds and cook for 1 more minute, then remove from the heat and mash the berries until mostly broken down. Let cool, then chill until needed, up to 1 week. Whip together the mascarpone, cream, vanilla, and maple syrup together until the mixture holds firm peaks. Chill until needed. To assemble the cake, remove one cake layer from the pan and peel off the parchment. Place the cake layer right-side up on a serving platter and spread with a little less than half of the whipped mascarpone. Dollop half of the strawberry jam over the cream and swirl lightly. Top with a layer of quartered strawberries and dollop with a bit more whipped mascarpone (this helps the upper layer stick to the bottom layer). Remove the second cake layer from the pan, remove the parchment, and place on top of the bottom layer. Top with the remaining whipped mascarpone, swirls of jam, and the remaining quartered and halved berries. Decorate with maple candy, if using. Serve right away or chill for up to several hours before serving. To serve, use a large, sharp chef’s knife dipped in hot water and wiped clean between each cut to slice the cake into wedges. Leftovers keep well in the refrigerator for up to 3 days.